The 20-year-old has agreed a deal to extend his stay at Turf Moor until June 2020. Dunne during international duty for Ireland. 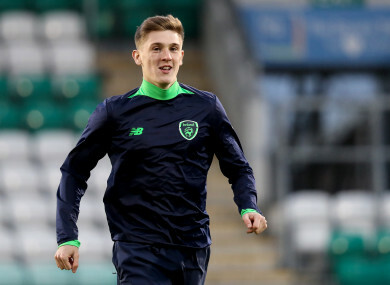 REPUBLIC OF IRELAND U21 international Jimmy Dunne has signed a new contract with Burnley and will join Scottish side Hearts on loan to gain experience. The Premier League side has announced that the 20-year-old Drogheda-born defender has agreed a deal which will extend his stay at Turf Moor until June 2020, with the option of a further 12 months. He will now join Hearts until 7 January, having scored the only goal in a pre-season friendly between Burnley and Cork City in July. “The new contract gives me not only security, but a chance to be part of a club that is really progressing and has been on the up for the past few seasons,” Dunne told Burnley’s official website. “For me to remain part of that is a massive thing for me and my development. “I will still be in contact with the coaches at Burnley and this time next year hopefully they will see me in a higher position than this summer. “Hearts have been unfortunate with injuries, particularly at the back, and I feel lucky to have been able to get this deal to hopefully help plug the gap and play in some huge games. I know that Hearts have been off to a great start and they’re going to look to continue that run, so I just want to be a part of that. Dunne, who is yet to be capped at senior level for Ireland, joined Burnley in 2016 after leaving Manchester United. He was involved at first-team level with the Clarets during pre-season, featuring in friendlies against Preston North End, Montpellier and Espanyol. He is yet to make a competitive appearance for Burnley but played first-team football on loan at Barrow and Accrington Stanley last season. Email “Dunne and dusted: Ireland U21 defender heads to Hearts after signing new Burnley contract”. Feedback on “Dunne and dusted: Ireland U21 defender heads to Hearts after signing new Burnley contract”.